Adenosine with triphosphoric acid esterified at its 5' position; immediate precursor of adenine nucleotides in RNA; the primary energy currency of a cell. a compound consisting of the nucleotide adenosine (A) attached through its ribose group to three phosphoric acid molecules (P). Hydrolysis of ATP to adenosine diphosphate (D) releases energy. By coupling a less favorable reaction in the cell with this hydrolysis, the less favorable reaction may proceed, allowing one to think of ATP as the cellular energy currency, especially in muscle. An adenosine with 3 high-energy phosphates, which is required for RNA synthesis and present in all living cells; ATP is a key energy source which drives many metabolic processes, including those involving motor proteins, movement of molecules against concentration gradients and the synthesis of proteins, nucleic acids and other molecules. A compound found in cells, consisting of the NUCLEOSIDE adenosine attached to three molecules of phosphoric acid. Adenosine triphosphate is the main energy-releasing entity of the cell. 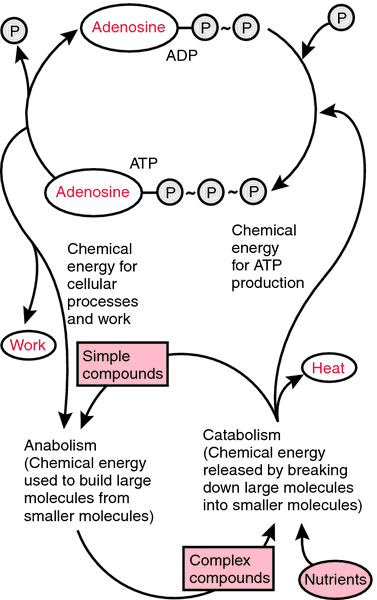 While it is being formed from adenosine diphosphate (ADP), ATP accepts energy from the breakdown of fuel molecules. During its breakdown to ADP or AMP it donates the energy to cell functions. As the energy source for the entire body, ATP is constantly being formed and broken down. At rest, a human consumes about 40 Kg of ATP per day. During strenuous exercise the rate of ATP cycling may reach half a Kg per minute. Adenosine with triphosphoric acid esterified at its 5' position; immediate precursor of adenine nucleotides in RNA; the promary energeny of a cell. Human mtDNA consists of 13 genes encoding proteins that enable mitochondria to produce the energy-storage molecule adenosine triphosphate (ATP) in a process known as cellular respiration. According to the company, Adenosine triphosphate (ATP) sanitation monitoring systems are used extensively in the food industry to instantly assess the effectiveness of sanitation programmes. It is believed that P57 works by increasing adenosine triphosphate (ATP) in nerve cells in the hypothalamus, the brain's control center for regulating thirst, temperature and appetite. MLS is based on the measurement of adenosine triphosphate (ATP) - the chemical found in all living cells. This is a nutritional supplement containing Ribose, the breakthrough carbohydrate ingredient that boosts the creation of Adenosine Triphosphate in muscles. The protein that Montemagno and his colleagues used is an enzyme ATP synthase, which produces the cellular fuel adenosine triphosphate. It consists of ten vials containing a fixed amount of adenosine triphosphate. This process allows the cell to maintain its production of adenosine triphosphate, or ATP, an energy molecule that powers many cell functions. Spotcheck is reckoned to be the world's first rapid hygiene monitoring device that can detect the presence of adenosine triphosphate by a visible colour reaction. This enzyme produces adenosine triphosphate (ATP), the compound that cells break down to obtain energy.